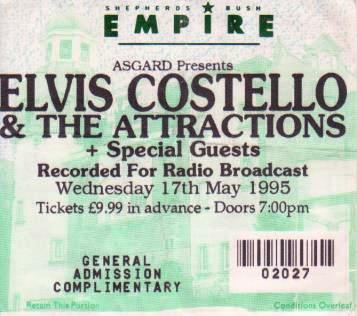 This is my 3rd blog post of Elvis Costello gig memories, you can read part 1 right here and part 2 here. Don’t think it was well publicised that Elvis was going to be the support act here but a mate who worked at the venue tipped me off about it. Just like most support acts, most of the crowd weren’t that interested and were just talking which is number 1 on the list of the 3 worst things you can do at a gig. Despite all the talking, I really enjoyed this gig. I loved hearing a mix of new songs (from All This Useless Beauty) and a few older favourites. I was standing downstairs near the front for Elvis but when Dylan came on, I decided to get a seat on the balcony upstairs. At the end of Dylan’s set, Elvis came back on with Chrissie Hynde and Carole King to sing “I Shall Be Released.” Can’t find any footage of that but here’s a clip from the night before. 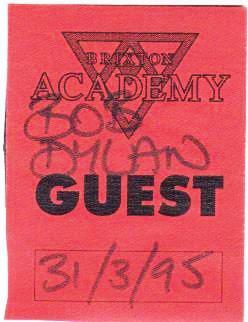 A lot’s been said over the years about the pros and cons of Bob Dylan live but I’ve got to say at these Brixton shows, he played a strong setlist and was in pretty good voice. Having said that, I’ve seen him 2 more times since and both times were rubbish! Elvis’ second album of covers, Kojak Variety, was released on this day so this show was being broadcast live on radio in the USA to promote the album. 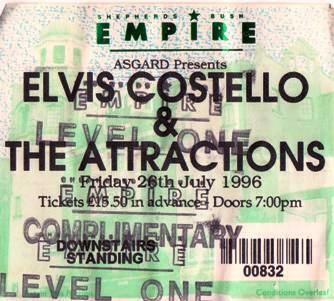 Consequently, ticket prices were low and Elvis just played the album straight through. Well, not quite, he played a solo version of Girl’s Talk at the start and encored with Alison & Pump It Up but apart from that it was just the new album. I got in for nothing thanks to the aforementioned girlfriend that worked in the box office but my mate Pompey Mike came with me to this gig and left feeling pretty shortchanged and vowing not to bother spending his money on Elvis gigs anymore! The Attractions were joined by 2 guitar legends, Marc Ribot and James Burton but even so I’ve got to admit it was a bit dull. Another from my ticket collection. Exciting stuff eh. I was gutted to miss the the gig Elvis and Burt Bacharach did together in October 1998 but I was out of the country at the time. Another from my ticket collection. The long winter evenings just fly by round here. The following year I was back at the Albert Hall (but with a decent seat this time) to see Elvis and Steve play an absolute blinder. Plenty of the Bacharach songs got an airing and in the last song (Couldn’t Call It Unexpected), Elvis did that old Tony Bennett trick of singing with no mike. Loved that trick then and still love it when he does it now. Here’s a 2003 version. In 2001, Robert Wyatt was curating the “Meltdown Festival” on London’s South Bank which Elvis himself had curated a few years before. I bought tickets and went along not really knowing what to expect. There’d been no new album since “Painted From Memory” 3 years earlier but he’d had a big hand in making an album called “For the Stars” with the opera singer Anne Sofie von Otter and I’d also heard a bootleg of a new song that I really liked called “Alibi Factory”. 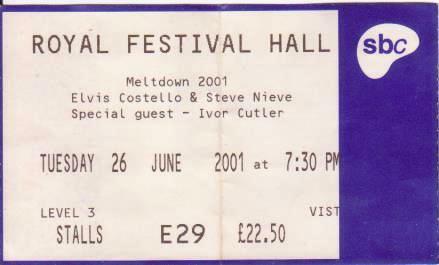 As you can see from the ticket, the gig had been billed as “Elvis Costello & Steve Nieve” but it didn’t really pan out like that. The show opened with some inspired poetry and songs from the great genius Ivor Cutler and his trusty harmonium. We miss you Ivor! 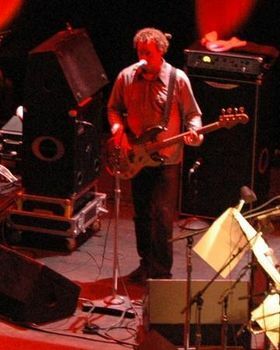 But wait a minute, who’s that playing bass? That ain’t Bruce! It’s not Nick Lowe either! These days Davey Farragher is a familiar and much-loved face to Costellophiles but at the time nobody knew who he was. We didn’t know it then but this was the first ever appearance of The Imposters. History in the making! Posted by chorizogarbanzo on July 30, 2013 in Blog posts, Elvis Costello gig memories and tagged attractions, bob dylan, elvis costello, ivor cutler, London, pete thomas, robert wyatt, ron sexsmith, Royal Albert Hall, steve nieve.